Those adorable wrinkles sometimes come at a price. 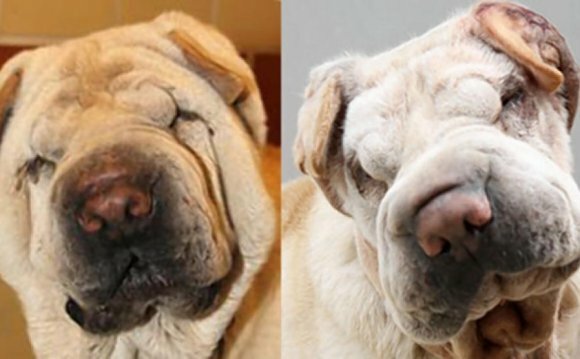 The loose, wrinkly skin that characterizes shar pei is actually the result of a genetic mutation; it gives the dog a very cute appearance, but shar peis suffer from a number of skin problems. Look out for signs of discomfort so you can spot problems early and get them fixed. The folded skin creates the perfect place for bacteria to thrive, as it is warm and damp. All dogs have bacteria on their skin, but because the areas inside the folds aren’t ventilated, bacteria can multiply quickly. Once bacteria become abundant between the folds, infection is likely to occur. Look inside the folds for redness and irritation to determine whether your dog has a skin fold infection. If you notice an unpleasant odor emanating from your dog’s skin, this is a sign of infection too. You can treat and prevent skin fold infection by using a mild antibacterial soap to wash between the folds frequently—as often as once a week if your dog is prone to this problem. If the skin is broken, lumpy and particularly smelly, take your dog to the vet, as this signifies a serious infection. In severe and chronic cases, your vet may want to perform a simple skin lift procedure to reduce the folds and limit infection. Demodectic mange is caused by mites that live in the hair follicles. These unwelcome guests prefer the follicles of short-haired breeds like your shar pei. Symptoms include localized redness, scaliness, inflammation and hair loss. Demodectic mange can occur almost anywhere on your dog’s body, but is most often found around the eyes, muzzle and paws. In severe cases, the mange can cover the trunk, legs, back and belly. In mild cases, the dog’s immune system will handle this problem and it will heal naturally. If the condition persists, your vet will treat it with an antibacterial gel. The thyroid gland regulates the release of metabolic hormones. If it is overactive, the metabolism goes out of whack, causing a number of symptoms. One of the first is a dull, lackluster coat. However, a dull coat can also indicate poor diet, fleas or general ill health. So look out for other symptoms, such as low energy levels and facial puffiness, before panicking about hypothyroidism. The skin element of this disease is quite distinctly delineated along the body: there is typically an obvious separation between affected and unaffected areas. Shar pei loosely translates as “rough skin." Dogs with short, bristly coats like the shar pei are prone to pyoderma, a broad term indicating skin irritation involving pus. Dogs like the shar pei can get it from ingrown hairs causing irritation to hair follicles. It can occur anywhere on the body, but is most common around the paws. Dogs with really loose skin suffer from inhibited vision, as the folds on the forehead obscure the eyes. Sadly, this is typically the result of selective breeding by people who want to exaggerate the skin fold characteristic. Minor cosmetic surgery is the likely treatment.